In between watching the Google Wave video and Slumdog Millionaire, I got around to completing the first set of tabs for the ribbon in RSS Bandit. Screenshots are below, as usual let me know what you think. Fig 1: The home tab. This is the default tab on launching the application. I like that formerly hidden features of the application like subscribing to newsgroups and managing podcasts are now front and center without having to compromise on the common tasks that people want to perform. Fig 2: The ability to synchronize RSS Bandit with your Google Reader or NewsGator Online feeds is also now a lot more discoverable instead of being hidden in some obscure menu with an obscure name ("Synchronize Feeds"). Fig 3: The folder tab. This is menu is contextual and becomes selected when you click on a folder in the tree view. There are two features I’d like to call out in this view; Rules and Filters. Fig 4: The rules tool is where we’ll end up placing existing and new options on behavior the user would like executed on receipt or viewing of new content. Fig 5: The filter tool is used for filtering the items that show up in the list view. We've had several requests for this feature over the past few years but couldn’t figure out an elegant way to incorporate it into the user interface. 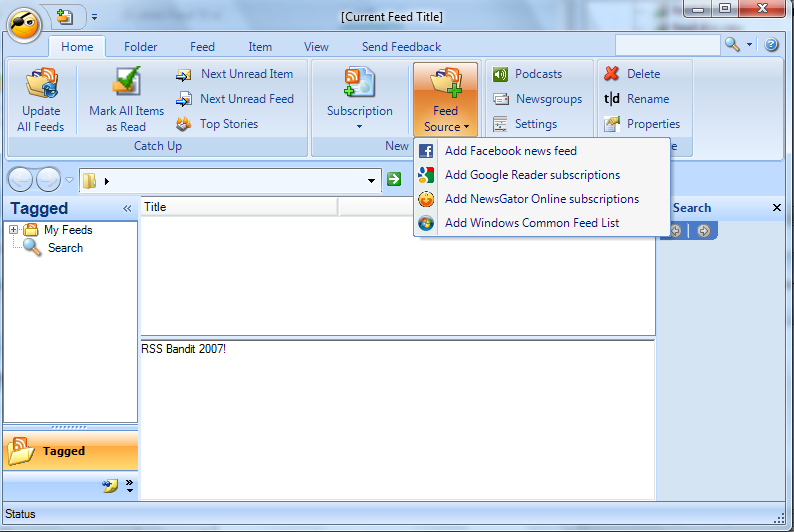 Fig 6: The feed tab. This is a contextual tab that is selected when you click on a feed in the tree view. One feature that I love which is now properly highlighted is that we support creating new posts in feeds that support this such as newsgroups (existing feature) or posting a new status update on Facebook if you have hooked it up as a feed source (new feature). Fig 7: The item tab. This is the contextual tab that is highlighted when you select an item in the list view. There are no new features highlighted here. What we do think will be interesting is if we make it straightforward for existing and new IBlogExtension plugins to end up showing up in the item tab. So you should think of this tab as being extensible and should expect that some of our existing plugins (e.g. "Email This", "Post to Twitter", etc) will also end up in this tab. Looks very nice. I'm assuming there is a way to hide the address bar. It takes up space and I never use it so I'm hoping this is possible. Rules and filters look exciting and the show only unread is *really* welcome. Can rules be added to searches. For example, I'd like to be able to mark items hat match a search as "read' or "unread" or be able to automatically tage them. Things look pretty good and I like the discoverability of the features. However, the toolbar looks rather out of place with the back and forward buttons. The ribbon is larger than the current toolbar, when you add to it the navigation toolbar, title bars, tabs and status bar all this will take about a third of my screen space - this is not acceptable. at least try to insert the navigation bar into the ribbon, I use it very rarely and it's mostly empty. i like the ribbon. took some time getting use to it in Office but now love it. Ill also second the comment above about the navigation bar. I think justausr,zian, robert, kal, nir and donald had good suggestions about the addressbar and the ribbon, think the same of it! thank you for your good work, the bandit is one of the programms i can't miss - it's a MUST HAVE! Btw, large icons on last screenshot look ugly with those huge pixels. You've got context tabs but no context colouring - is this deliberate? You've got a couple of buttons (Filter and Rules) that only have one item below them. Standard UI practice would be to promote the sub-items up to the top level to reduce the number of clicks required to use those features. The Forward & Back buttons and Address box & Go button would be better incorporated into the Home tab of the Ribbon to save vertical space. You also need buttons for "Stop", "New Tab" and "Open in Browser". Not bad. I don't mind the space taken up because of my monitor size but I do understand what the others are saying. I am more intrigued by what looks like a replacement of the tree control for the feeds. It looks horrible in the latest version on Vista. The key to whether to use a ribbon control is whether you can actually populate it with valid options. Like I said, I like what I see so far. Looks good, but I have one serious concern. How about the speed? Is that going to be fixed? It takes me like 5 minutes to delete feeds. I hope this version has the search bug fixed. Current version can not return proper search results even the result is so obvious. Please test it then you know it. Thanks!